Guide to Dona Ana County, New Mexico ancestry, genealogy and family history, birth records, marriage records, death records, census records, family history, and military records. Clerk District Court has divorce and court records. 1600s - New Spain obtained control over the land that later would become New Mexico and Arizona. Some records of early settlers may have been sent to archives in Seville, Spain, or to archives in Mexico City. 1821 - Mexico received jurisdiction over the land that later would become New Mexico and Arizona. Some records of this period may have been sent to archives in Mexico City. 1846 - United States forces occupied New Mexico during the Mexican-American War. 1848 - Land that became the Territory of New Mexico formally became a part of the United States when the Mexican-American War ended with the signing of the Treaty of Guadalupe Hidalgo. 9 January 1852 - Doña Ana County was created from unorganized land in New Mexico Territory. Doña Ana county extended from Texas on the east onto land in present day Arizona on the west. Residents living far from the county seat, probably didn't send many records to the county offices. 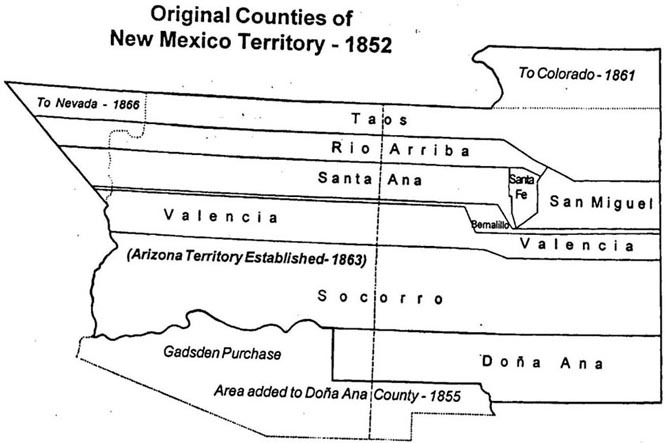 3 February 1855 - Doña Ana County gained all of the Gadsden Purchase land from Mexico. This included land south of the Gila River in present day Arizona, which extended Dona Ana county west to the Baja California border. 24 February 1863 Arizona was created from the western half of New Mexico Territory. Dona Ana county was reduced in size to the portion that was still in New Mexico Territory. "Rotating Formation New Mexico County Boundary Maps" (1845-1981) may be viewed for free at the MapofUS.org website. Doña Ana and other counties in New Mexico Territory in 1852. Dona Ana county online record search You do not need to Register, Sign on as Guest. Some records found online go back to the 1950's. But most are from the 1970 to the present. If searching for an older record, you may have to visit the County Clerks Office. Local histories are available for Dona Ana County, New Mexico Genealogy. County histories may include biographies, church, school and government history, and military information. For more information about local histories, see the wiki page section New Mexico Local Histories. ↑ Handybook for Genealogists: United States of America, 10th ed. (Draper, Utah: Everton Pub., 2002), Donna Anna County, New Mexico. Page 473 At various libraries (WorldCat); FHL Book 973 D27e 2002; Alice Eichholz, ed. Ancestry’s Red Book: American State, County, and Town Sources, Third ed. (Provo, Utah: Ancestry, 2004), 470. ↑ Wikipedia contributors, "1st Arizona Territorial Legislature" in Wikipedia: the Free Encyclopedia at http://en.wikipedia.org/wiki/1st_Arizona_Territorial_Legislature (accessed 8 August 2011). ↑ Wikipedia contributors, "Doña Ana County, New Mexico, New Mexico," in Wikipedia: the Free Encyclopedia,https://en.wikipedia.org/wiki/Do%C3%B1a_Ana_County,_New_Mexico, accessed 30 January 2019. This page was last modified on 30 January 2019, at 21:14.